Something that Christians know, but they are not willing to say it out loud and/or they are not willing to live within the knowledge of is the fact that this world is not ours. For this age, God has allowed Satan to become the ruler of this world. The society that we live in is misled by the prince of darkness. The culture is confused, corrupted, perverted, and downright ridiculous. The Apostle begins his letter to the Galatians by saying, “Grace to you and peace from God the Father and our Lord Jesus Christ, who gave Himself for our sins, that He might deliver us from this present evil age, according to the will of our God and Father, to whom be glory forever and ever. Amen” (Galatians 1:3-5). We live in a “present evil age” that is filled with nonsense, falsities, and deceptions, but we have been delivered from it. So many believers live as if nothing in this age matters, and salvation is only for the next age. In Sunday School, we recently studied the parable of the rich man and Lazarus. I admit that I struggle in interpreting the message of the parable, but one thing is clear in Jesus’ teaching: this age has a whole lot to do with the next. The problem is that many Christians have no thought for holiness, that is, being set apart from the world for the purposes of God. Christians continue to store up treasures on earth and are not considering the eternal things of God. What about the Scriptures that command: “lay up treasures in heaven” (Matt 6:20); “set your minds on things above” (Col 3:2); “do not be conformed to this world, but be transformed by the renewing of your mind” (Rom 12:2); and so many more (check out Eph 4:22-24 and Phil 4:8)?! So many Christians are caught up in the culture. They are holy on Sundays (maybe), and the rest of the week they make all of their decisions based on worldly and selfish principles. Some Christians are possibly burdened by the guilt that they feel over this issue, and something must be done about it. James, in the New Testament, talks about the person who is double-minded. The Elder teaches that God gives wisdom liberally to those who ask for it, but they must ask in full faith with no doubting. The person who intermingles faith with doubting (may I say godliness with worldliness? ), “That person should not expect to receive anything from the Lord. Such a person is double-minded and unstable in all they do” (James 1:7-8). How many Christians in our American culture are double-minded and unstable? This has great affects too because James says that person is unstable in all they do. Let me encourage you to be a counterculture Christian and not a double-minded individual. Living a countercultural life will not be easy. Jesus did not promise that the holy and righteous life that pleases God is comfortable. In fact, He said, “He who finds his life will lose it, and he who loses his life for My sake will find it” (Matt 10:39). You may feel like your “losing” in this age, but you will find eternal life into the next age. The countercultural life does not make you a loser, but it will challenge you emotionally, spiritually, and maybe even physically as you weather the storm of this fallen world and the opponents that are within it. Moreover, let me suggest that those who pursue the double-minded life, worshiping God on Sundays (or less) and pursuing worldly ends the other six days, are bordering on disaster and utter ruin in this age and the next. God desires, even demands, our undivided attention. He wants single-minded devotion. Your loyalties cannot be at odds. Jesus had something memorable to say on this very subject. He said, “No one can serve two masters; for either he will hate the one and love the other, or else he will be loyal to the one and despise the other. You cannot serve God and mammon” (Matt 6:24). “Mammon” has been translated as “money” in several versions, but refers to much more. It refers to all our monies, possessions, experiences, preoccupations, earthly treasures, and all of the details of life. I read several commentaries on this verse and two older scholars proved to be most helpful. A. T. Robertson says, “Mammon is a Chaldee, Syriac, and Punic word like Plutus for the money god (or devil). The slave of mammon will obey mammon while pretending to obey God.” After a discussion of the term meaning “material possessions,” as almost all scholars agree, William Barclay says, “But the word mamon had a most curious and a most revealing history. . . . The end of the process was that mamon came to be spelled with a capital M and came to be regarded as nothing less than a god.” It may be summarized that Mamon is the god of all worldly things. The Lord says that you cannot serve both God and Mamon. Yet, so many Christians are trying to do just that. They are pursuing this fleshly desire and that worldly aspiration with no thought of the eternal ramifications of such pursuits. The person who has divided loyalties nauseates the Lord (Rev 3:16) and can expect nothing from Him (Jas 1:7). Let me encourage you to live the Christian life that is countercultural. The Christian life that conforms to the culture is dangerous. It can be destructive in this age and much worse in the next. We have to learn how to live in this world, but not be of it, and we must learn how to effectively minister in this world while not falling into the traps of its temptations. Any suggestions on how to live and minister counterculturally, but effectively? 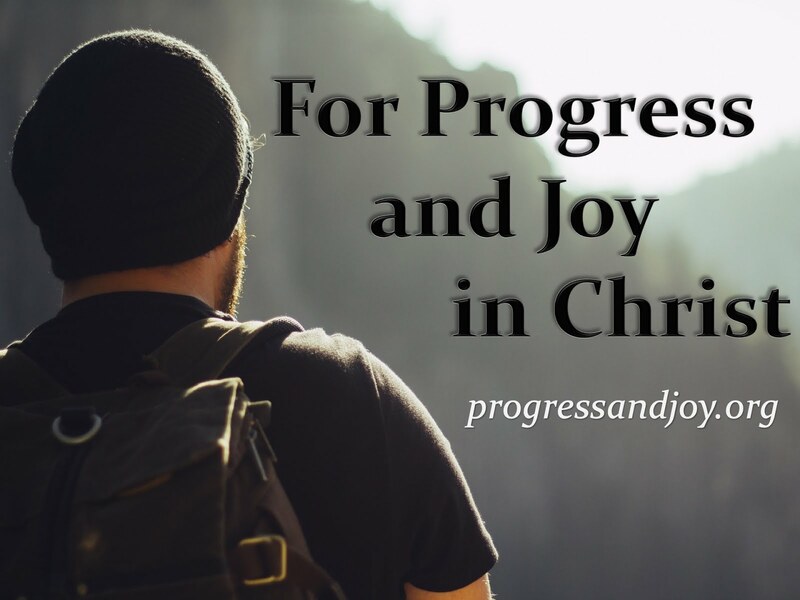 Send them our way by email or on the Progress and Joy Facebook page!